Nearbuy Survey Free Credit Loot Offer, Nearbuy New Year Survey Loot Offer, Fill Survey and Get Free Rs.50 Nearbuy Credit – Nearbuy is once again back with amazing and awesome offer. New Year is coming and Nearbuy presented New Year Special offer. Nearbuy present New Year Survey. 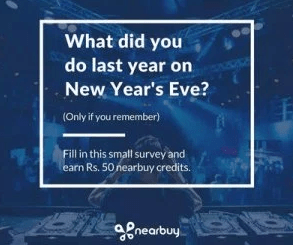 Just fill the Nearbuy New Year Survey and Get Rs.50 Nearbuy Credit Absolutely Free. This offer is valid for all Nearbuy users. Nearbuy is one of the best online platform to buy Local Deals, Gift Voucher and many more. So just complete the New Year Survey and get Free Rs.50 Credits. So this is just amazing offer for all complete the survey and get Free Rs.50 in your Nearbuy credit. Enter Your Nearbuy Email Id in Last. Like the Page & Message them your Email which you use at the time of Submitting survey. Now wait for 1-2 days. Finally you will get Free Rs.50 Nearbuy Credit in your wallet. You can use this wallet for buy anything. Enjoy the super loot of Nearbuy.